Hong Kong and Georgia signed a Free Trade Agreement (FTA) today (June 28), which will not only bring to our traders and businessmen legal certainty and better market access to the Georgian market, but also enhance the trade and investment flows between the two economies. 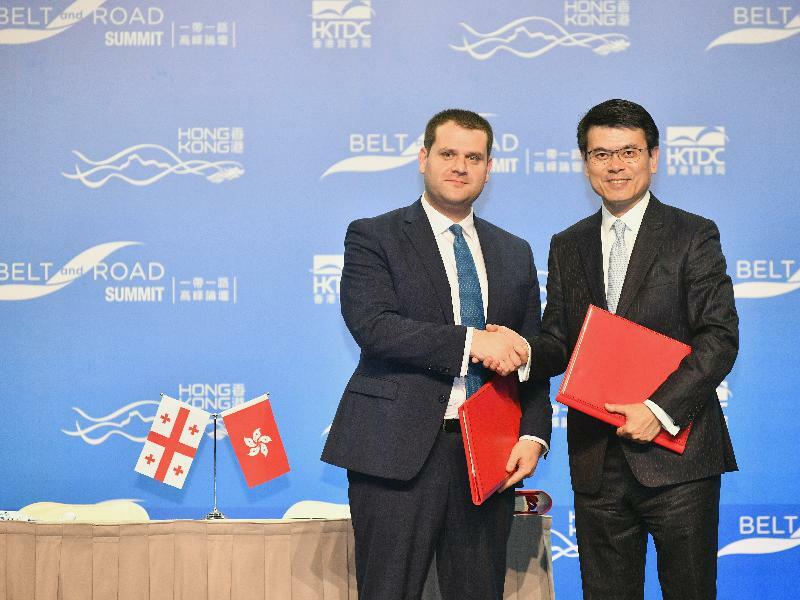 The Secretary for Commerce and Economic Development, Mr Edward Yau, and the Deputy Minister of Economy and Sustainable Development of Georgia, Mr Genadi Arveladze, signed the FTA at a signing ceremony in the Belt and Road Summit that was held today in Hong Kong. "This is the first FTA between Hong Kong and a country in the Caucasus. Georgia is a close trading partner of Hong Kong in the Caucasus and an emerging market with great potential for further growth. The FTA is comprehensive in scope, encompassing trade in goods, trade in services, investment, dispute settlement mechanism and other related areas. It will provide a platform for both parties to take their bilateral economic and trade relations to a new level, while offering ample opportunities for Hong Kong businessmen to tap the Georgian market and the Caucasus covered under the Belt and Road Initiative," Mr Yau said. "The expansion of our FTA network into the Eurasia region will further strengthen Hong Kong's role as an international trade, commerce and financial hub, and a gateway between the Mainland and our overseas trading partners," he said. On trade in goods, Georgia will eliminate import tariffs on 96.6 per cent of its tariff lines for Hong Kong's originating products upon the entry into force of the FTA. On trade in services, the FTA opens the doors of markets for sectors where Hong Kong has traditional strengths or has potential for further development. Sectors standing to benefit include financial services, telecommunications services, various business services, wholesale and retailing services, arbitration services, audiovisual services, construction and related engineering services, environmental services, various transport services and printing and publishing services. The total merchandise trade between Hong Kong and Georgia was HK$320 million in 2017. Georgia ranked 121st among Hong Kong's worldwide trading partners for trade in goods in 2017. Reciprocally, Hong Kong ranked 26th among Georgia's trading partners for trade in goods in 2016. The full text of the FTA will be uploaded to the Trade and Industry Department's website (www.tid.gov.hk).